My goal is to celebrate Local, all that includes . . . promoting Local small businesses in the mix. 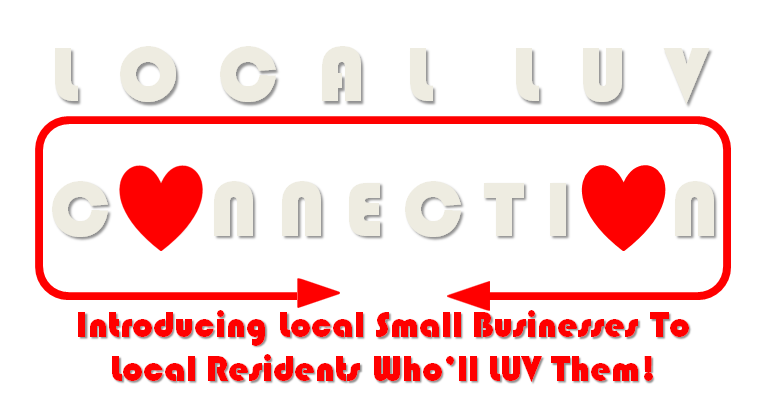 I want to introduce more Locals to Local small businesses offering products they’ll LUV. I hear it all the time from small businesses: I have to see results from the money I spend for marketing and advertising. I say I understand; and, I do. You should never spend money on anything which does not provide you at least an equivalent return, leaves you wondering. I try to provide the businesses I work with a significant bang for their buck. I hope it’s obvious: I enjoy – you could even say LUV – celebrating our community, including Local small businesses in what I do, appreciate the passion which has led them / you to do what you do, the passion and work required to keep it going. I do not take lightly any small business person’s faith in me, do not take it for granted, do not feel entitled in any way. If I ever show up simply expecting a check, show me the door and tell me never to return. Working with you is an honor I seek to earn, deserve going forward. I try to make what I do fun, entertaining, as I promote our community AND gain new exposure for businesses with which I am partnered. What I do is a little different, celebrating all I LUV and enjoy about this wonderful community, the small businesses I work with as part of it. It’s a unique concept from what’s out there, requires a lot of additional time on my part. But it’s fun to me, and I believe my efforts are appreciated not only by the small businesses I assist, but by the Locals who LUV this community as I do. You’ll find me not just posting during the week, but nights, weekends. I don’t sell anything. I share my enthusiasm for businesses, for what they offer, hoping others will be enthusiastic about them as well. A few recent examples of successes. An advertising major at UNC Chapel Hill and a marketing enthusiast, I know that the BEST promotion for anything is done in a positive and entertaining manner, repetitively over a period of time. I see my efforts for each individual business as a mini campaign, highlighting their strengths and personality. Social media to me is amazing and wonderful because it EMPOWERS individuals to make what you want happen all by yourself, or with little help. Phone books are irrelevant, and print media struggles. One time ads in any publication may or may not produce any results whatsoever. The best marketing and advertising is now done online for many reasons, including the ability to take viewers directly to more information about what you do. It also involves our friends, our neighbors, can provide an immediate personal endorsement from others which is priceless. Social media puts real opportunity within easy reach, via your laptop or smartphone. YOU can do it. When you’re out and about in a restaurant, at a concert, a public event, what do you see people doing CONSTANTLY? Yes, they’re on their phones. YOU can reach them there, anywhere. This is all new in the last 10 years. It’s an AMAZING time to be passionate about truly serving customers, communicating with them. Social media can be, should be FUN. I use the most dynamic, interactive platforms to celebrate Local . . . you and your business right along with it! The challenge then is time. You’re running your small business and anyone who has ever had one understands the time commitment, the energy required. You do not always have time to do all the things you wish, and to do them well often takes much of it. Want to network? 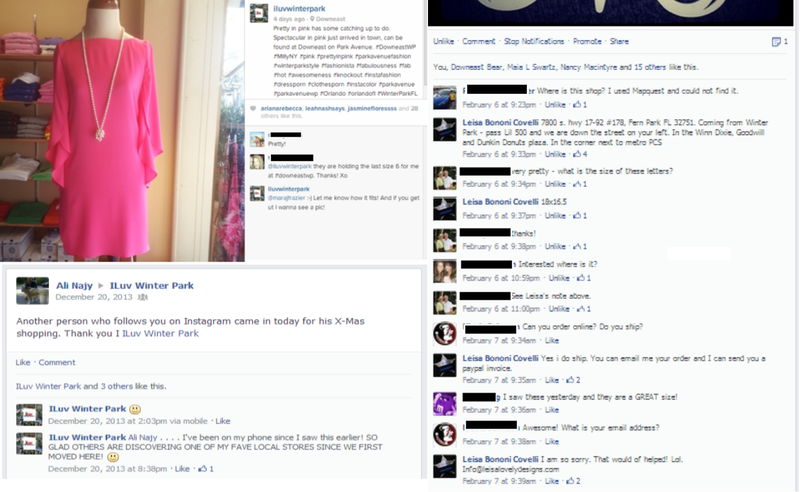 I have a FREE facebook page which is dedicated to that, with other Local small business people just like you. Want new customers? Social media can make it happen. But there are a few things to consider, no matter your strategy. What tools do you use to reach them? What is your message? Are you attempting to connect with existing customers or reach new ones? Multiple businesses or sellers under one roof? 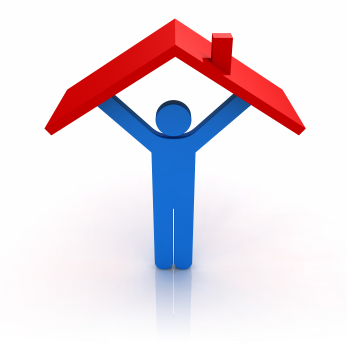 I have a special offer for you, the businesses you work with under your one roof! This past Christmas I worked with a variety of small businesses, including them in my facebook, Instagram, Pinterest, Twitter and Tumblr postings. In the last month I’ve been using Foursquare in very different ways, see that as a required staple in that basket. I’m also getting into I Heart It. Each social media vehicle is different, offers different benefits. Because I do a variety of businesses there are additional opportunities for a business to find new Local customers, for Local business fans to discover new businesses they have not frequented previously. The mix offers new possibilities for all involved. It works and I have seen the results occur right before my eyes again and again. With over 8,000 followers, the possibilities should continue increase all year. It’s fun. It’s positive. It’s all about Local. And I believe it’s the best advertising / marketing deal you will find ANYWHERE. If you use any other business or organization to expand your social media reach, compare us. Social media that’s been around a while is like taking a glass bottom boat at Silver Springs, a window into the soul of the business or group, telling you what they are all about, for better or worse. Last week I was told of a Local business person who had agreed to pay $1,500 PER MONTH to someone to increase his Twitter presence. Twitter can be great for increasing awareness of you, your business, but I would be surprised if anything is ever sold from a Tweet. Facebook, Instagram, Pinterest and Foursquare are far superior platforms for promoting anything you offer. Having said that, let me say that I do not want to SELL anything. My goal is to promote Local businesses and Locally offered items I am enthusiastic about, hoping others will be enthusiastic about them as well, want to check them out. In college while working at The Gap I was called a good salesperson and I saw it as an insult. It’s semantics, I guess, but I do not respond well to a heavy sales pitch, withdraw when any is given. I think most consumers now feel likewise, being pitched too much Viagra, etc. on television. I seek to be the OPPOSITE of such approaches, a celebration of supporting Local businesses, of what that can and does mean to our community. I truly do LUV Winter Park and working with small businesses, those which can react quickly, be nimble and focus on their customers. I will offer other opportunities this year to get involved in what I do, but there will be nothing approaching the value I am offering here. I will be rolling out other pieces included in this offer in the next few weeks . . . . special benefits for those who are on and around Park Avenue, others for those who are not. Let’s celebrate Local together this year. Let’s meet to discuss . 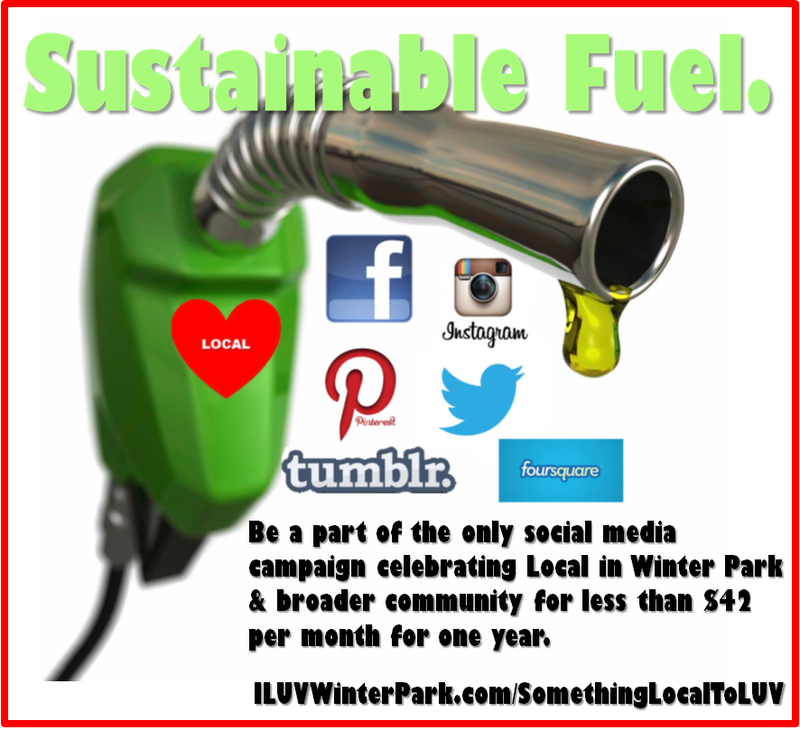 . . E-mail ILUVWinterPark@earthlink.net, phone 407.539.3977, or message on facebook to ILuv Winter Park. This entry was posted in Uncategorized and tagged facebook, florida, foursquare, i heart it, i luv park avenue, i luv winter park, instagram, local, orlando, park avenue, pinterest, small business, social media, twitter, winter park. Bookmark the permalink. Having been a small business owner and growing up in a home of self employed parents I totally get the advertising dilemma. My parents still own at business (at 78 yrs old) in West Palm Beach on Dixie Hwy, in 10 years they’ve seen almost every storefront come and go. I love Park Ave and the surrounding streets for shopping/eating but I haven’t spent much time or money there in the last few years. I’m so disappointed in what retail shops have to offer me. Mostly this comes from shop owners going to the same “shows” for buying. They are seeing the same vendors year in/out. We shoppers now how “flooded” the market is with brand names. I don’t know why shops w/in walking distance of one another want to have the same merchandise. I feel the best “advertising” is word of mouth. Finding products/clothes we love, that are different, made in the USA and are of quality is what sells me.